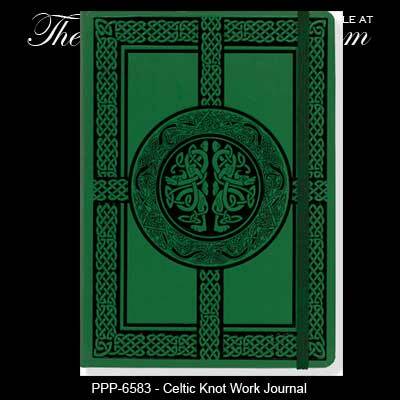 Irish journal features an embossed Celtic knot-work motif on the cover along with blank pages inside. This Irish gift for herself is also ideal for himself too. The cover of this Celtic journal features intricate knot work along with serpentine animal forms of the ancient Celts; it is additionally enhanced with black lacquer effects. The Irish journal has 160 pages of acid-free, archival quality paper and it is received with a Celtic knot history card, complements of The Irish Gift House. Its popular small format size—5'' wide x 7'' high—fits easily in backpacks, tote bags, and most purses. Elastic band placeholder helps you keep your place. Handy pocket inside back cover pocket is perfect for notes, business cards, receipts, etc.